Fig. 1 (and front picture). Ms. SUSU0014. Collection (maǧmū‘) from Suuse. Ff. 26r-31r: Al-kāfī fī ʻilmay al-ʻarūḍ wa-al-qawāfī, colophon dated 1343H (=1924-1925), ff. 31r. 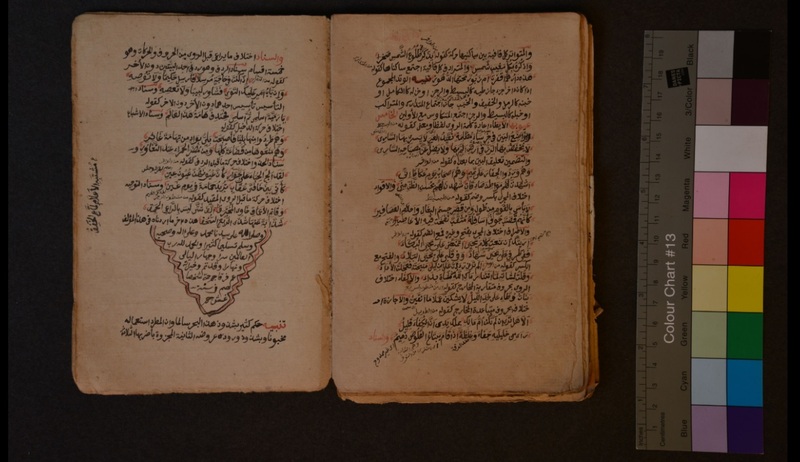 Historically, interest in Ethiopian texts in Arabic, and especially the manuscripts, has been sporadic. Researchers first looked at Christian writings in Ge’ez and Amharic, and at subsequent Amharic or Arabic versions and echoes of those writings. After some notable precursors (such as publisher and text collector Enrico Cerulli [Naples, 1898-Rome 1988] and Richard K.P. Pankhurst, both belonging to an epoch of encyclopaedic (or orientalist) “giants,” among whom Robert B. Serjeant is the Yemen’s equivalent), the late 1960s/early 1970s saw the emergence of more specialised authors. Between 1973 and 1997, Ewald Wagner published mainly on Harari sources (i.e. from the city of Harar) in the Harari language, but also some in Arabic, during a stay on site from 1966 to 1972. He initiated the inventory of Islamic manuscripts from Ethiopia in Afrikanische Handschriften. Part 2, 1997 (for a history of Islamic studies in Ethiopia and of Ethiopian manuscripts collections in the West, see A. Gori, « The Ethiopian Islamic Manuscripts: A Brief Overview, » in id., A. Handlist, 2014, pp. 37-41). Fig. 2. Ms. Zabbi Molla no. 0001, Zabbi Molla Library, in the surroundings of the town of Wolkite (for more details, see, http://www.islhornafr.eu/mission1.html#I1). Ff. 5r-96r: Ḫulāṣat muḫtaṣar taḥrīr al-uṣūl wa-al-awrād fī ḏikr tarāǧim ašyāḫinā wa-ašyāḫ nāḥiyatinā wa-al-asyād, written by Badr al-Dīn b. al-šayḫ Abī Muḥammad al-Ḥāǧǧ Muḥammad Surūr al-maʻrūf bi-Ubbī b. al-šayḫ Muḥammad Bašir al-Zabbī al-Qabīnī al-Šāfiʻī al-Qādirī al-Rašādī. Contains the story of the ṭarīqa rašādiyya and of his founder. Colophon dated 11.06.1409 (=19.01.1989). 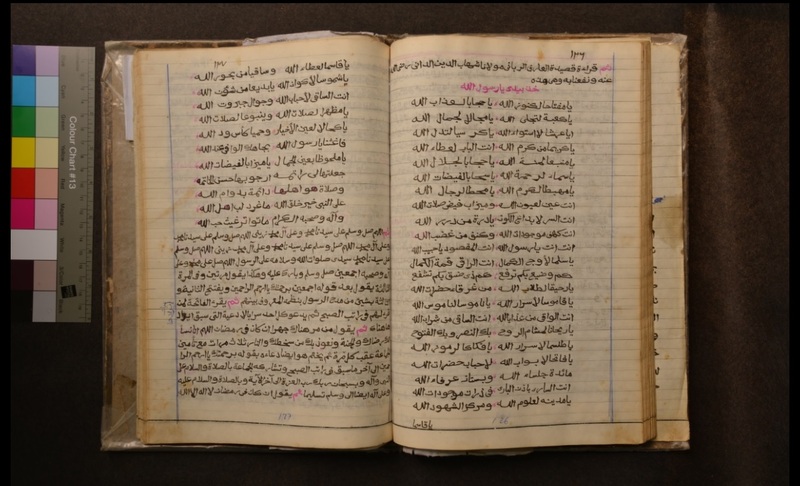 In 2014, a detailed inventory of the Arabic collections from the Institute of Ethiopian Studies at Addis Ababa University (the largest fully public library in the country) has been published (Gori, Handlist). It was preceded by the digitisation of those manuscripts in an operation funded by the British Library “Endangered Archives” initiative. It describes 303 manuscripts. The detailed inventory of the other major collection in the country, in the Abdullah Sharif Museum (Harar), a publicly accessible private collection, only began in 2015, again as a result of a digitisation campaign. The number of items in this collection exceeds 500. This collection continues to grow through donations and purchases. Recently, the Abdullah Sharif Museum inaugurated a “document” area, which displays, among other things, letters. Archives, even public ones, remain largely unexplored. In Islamized regions, libraries exist in a variety of religious institutions (Islamic schools, mausoleums, madrasas) and in the hands of individual scholars and clerics. Locating and accessing them comes through developing networks of personal contacts. This broad-brush picture gives an idea of the instruments available to researchers on site. We note, alongside Arabic texts in language and writing, the presence of ‘aǧamī, i.e. texts in local languages transcribed using the Arabic alphabet. Languages like Old Harari, Amharic, Oromo and Afar are already well-attested in ‘aǧamī manuscripts. The existence of ‘aǧamī textes in Africa is well known, as is the use of the Arabic alphabet to write in languages that are unrelated to Arabic (Spanish, Hebrew…). Nothing specific to Ethiopia, then, but it complicates access to these texts. The detailed inventory of IES also shows the presence of Old Harari, Amharic and Oromo materials. A first overview suggests the existence of a regional diversity (cf. the first articles on Harari bindings by R. Pankhurst). 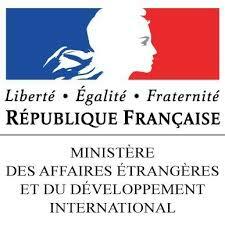 But if some production centres of manuscripts, such as Harar, the Wallo, or the Afar region, are clearly identified, we are very hazy about others. To be able to define all the parameters used to identify the place of production of a manuscript, one must compare manuscripts collected from everywhere, or whose provenance is a priori diverse. The ERC research project “Islam in the Horn of Africa. A Comparative Literary Approach” (http://www.islhornafr.eu; ERC Advanced Grant No. 322849), led by Alessandro Gori, arose from this understanding. At the heart of the program, is the systematic recording of texts in the Horn of Africa (Ethiopia, Eritrea, Djibouti, Somalia), whether handwritten or printed, with the historical ambition of bringing to light new sources and ultimately making apparent what are original or local contributions. Taking the direction initiated by E. Wagner in 1997, its aim is that of a complete census, followed by the classification and identification of every text. 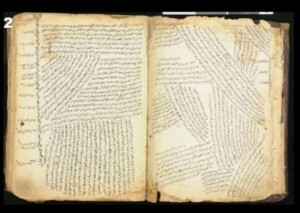 It includes texts which were copied, but not produced, within the area. It therefore suggests the presence of texts beyond those that are canonical, auxiliary or preparatory to religious studies, and makes a point about the general perception of Islamic Ethiopia. Among them, the mystical texts (Sufism) have an important position. Fig. 3. Ms. USWE00007. Coll. Gerald and Barbara Weiner. Ff. 1v-2r: marginalia, various notes. The more adapted tool to achieve the main goal of the program is a database. Technically very nearly completed, it contained by the end of February 2016 some 450 volume entries and over 850 title entries, made by five contributors and drawing on various public and private collections (see ill.). 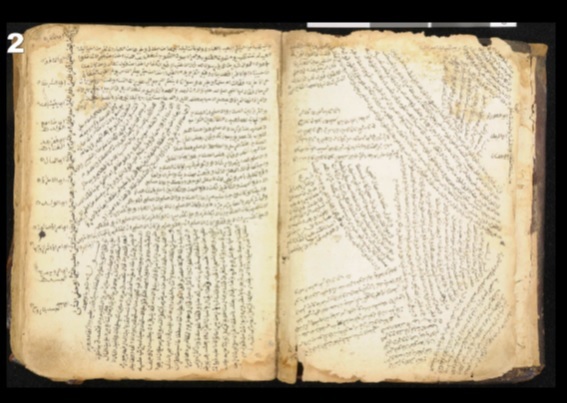 It emphasizes the text of marginalia: those containing property marks (or similar), waqf deeds, information on transmission, and finally, other types of text, whose exact link to the manuscript is sometimes lost or unclear and remains to be determined. The patient and meticulous creation of multiple links between items and sections facilitates the tracking of networks, regional ties and extra-regional or other transmission paths (for an overview of the publications and presentations of the members of the ERC “Islam in the Horn of Africa,” see http://www.islhornafr.eu/publ.html; Ethiopia takes the lion’s share). The paper version of fascicule 1 of the inventory of the Abdullah Sharif collection, No. 1-99, is in its final phase. The listings follow the model of the detailed inventory of IES (Gori, Handlist). Its introductory part will include a contribution on illuminated manuscripts. Its manuscripts 1-92 are Qur’ans or sections of Qur’ans (ǧuz’). A selection of manuscripts suitable for the constitution of a palaeographic album will appear as an appendix. In fact many manuscripts in Ethiopia have no colophon. The study of their paper is therefore of considerable importance. In spring 2015 as part of the activities of the project “IslHornAfr,” I was able to continue a study of paper manuscripts of the IES, begun in 2010 (CFEE mission, my contribution to A. Gori, Handlist). The 2010 mission allowed the establishment of an overview. Finally, manuscripts dating from the nineteenth and twentieth centuries were the object of the 2015 mission. Once compared with the paper of other collections – mostly Yemeni (see A. Regourd, “Watermarked paper of manuscripts in Zabīd, first third of the eighteenth-mid twentieth century: papers imported and ‘local’,” 2015), groups of papers can be distinguished and a typology emerges. The publication is under way. Gori, Alessandro, A Handlist of the Manuscripts in the Institute for Ethiopian Studies. The Arabic Material of the Ethiopian Islamic Tradition, Eugene (OR), Pickwick Publication, « Ethiopian Manuscrits, Texts, and Studies Series », 2014. « Islam in the Horn of Africa », publications and activities, http://www.islhornafr.eu/publ.html. Regourd, Anne, « Codicology (Papers, Ruling, Bindings) and Annex on Dated manuscripts (Palaeographie), » in A. Gori, A Handlist of the Manuscripts in the Institute for Ethiopian Studies, 2014. Regourd, Anne, « Papiers filigranés de manuscrits de Zabīd, premier tiers du XVIIIe-milieu du XXe siècle : papiers importés et ‘locaux’ », chap. 8 in D. Hollenberg, Ch. Rauch & S. Schmidtke, eds., The Yemeni Manuscript Tradition, Leyde/Boston, E.J. Brill, 2015, pp. 227-251. Wagner, Ewald, Afrikanische Handschriften. Part 2. Islamische Handschriften aus Äthiopien, Stuttgart, Franz Steiner, 1997.